The Common Carp is a member of the Cyprinidae family of fish’s and has a vast global distribution spanning Europe the Americas and Asian subcontinent. The Common Carp is a domesticated species which has ancestry dating back to a wild strain of carp located near the Caspian Sea region and Eastern Asia. Evidence of the farming of the Common Carp in Japan dates back to the Yayoi period (300 BC – 300 AD) and is also well documented in Roman times and the medieval monasteries of Europe right up to present day. Other variants of this species caused by the domestication of the original wild strain of carp include Mirror Carp (with large plated mirror like scales), Linear Carp (scale-less except for a row of large scales along the lateral line) and Leather Carp (un-scaled) and Fully Scaled. The Common Carp has an extremely wide range and has a worldwide distribution spanning the majority of continents and is present in 59 different countries where it is found in various river systems, lakes, streams and ponds. The Common Carp subsists on a varied diet consisting of zoo plankton, crustaceans, insects, benthic worms and on occasion small fish. The Common Carp is an omnivorous freshwater fish which displays to pairs of small sensory barbels located at the corners of its mouth. The entire tapered body of the Common Carp is covered with a mesh-like covering of golden to bronze scales and is equipped with a large caudal fin (tail). The beautiful Common Carp comes in a variety of streamlined shapes ranging in form from sleek ‘Wild’ torpedo shaped specimens more closely related to the older and wilder strain to deep broad bodied specimens displaying large rotund stomachs and paddle-like tails. Although the Common Carp generally spawns in the spring months the Common Carp is capable of spawning multiple times in a year given suitable breeding conditions and can lay an astonishing three hundred thousand eggs at a time. Due to this phenomenal reproductive rate the Common Carp has been labeled an invasive species in some countries where other native species have been threatened or made extinct due to the excessive breeding habits and destructive feeding of the Common Carp. The Common Carp is a highly popular coarse fish in the UK and Europe which is fished for exclusively by a large section of the recreational angling community in Europe. The Common Carp is found in various freshwater fishing lakes and ponds in Thailand and has been recorded at weights upto 30lb’s. 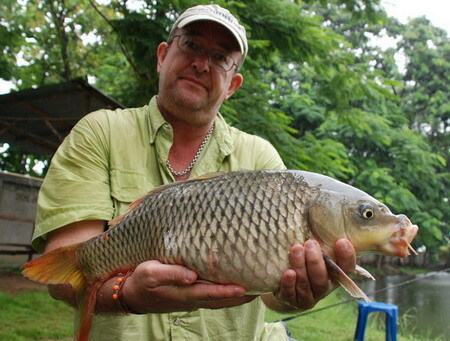 The Common Carp in Thailand is a rarely captured freshwater fish which ranges in weight between 10-30 lb’s and is a most welcome capture to the visiting carp angler to Thailand. Common Carp in Thailand have not reached maximum weights comparable with its European counterparts which feed on much richer and higher nutritional baits such as boilies. The world record Common Carp currently weighs 88 lb 2 oz which was caught from Les Teillatts in France by UK carp angler Roger Hanley.